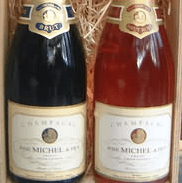 1 bottle of Jose Michel Champagne pink and 1 box Belgian Chocolates, a collection of the finest Belgian chocolates 190g boxed in a beautiful gift box. Then you can select a Birthday, free card or thank you card to add to your gift. 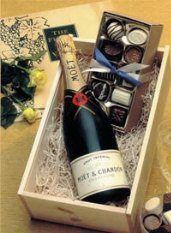 1 bottle of Moet Chandon Champagne gift set with wooden box. One Champagne stopper, one bottle ring and one Champagne pouring top. 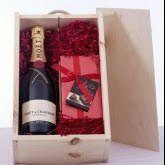 Veuve Clicquot Champagne gift with crafted wooden case wooden handles with a 1 Champagne stopper, 1 Ring top and 1 pouring champagne accessory. 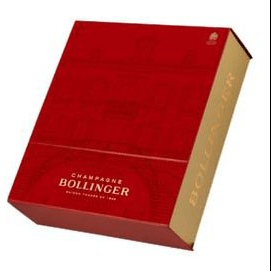 Moet Champagne and a large box of Belgian Chocolates 190g packed in a wooden box. If this is a special gift you can pick the delivery date after you checkout.